Despite having two kids and being married to the military, I'm more than a mom. R10: dc in every stitch, pull tail through last stitch until you have a loop as long as you'd like leaving enough extra yarn for the knot, then tighten. Take the loop and knot it, making sure the knot is snug against the dish cloth, then break yarn close to, but not right up against the knot. 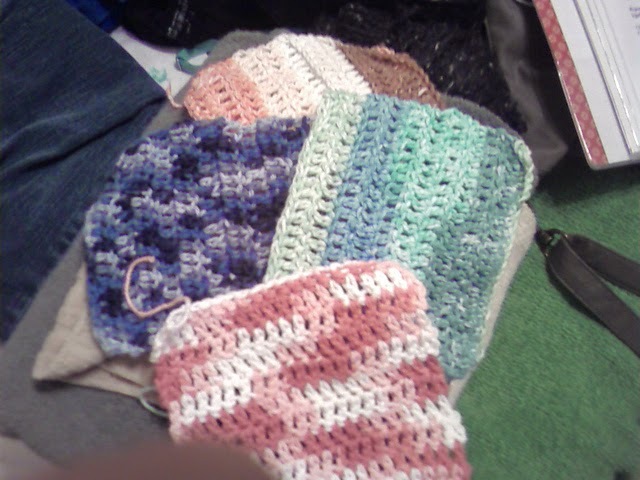 Makes approximately one 6in x 6in dish cloth. To make it bigger chain extra stitches and measure, then repeat row 2 until length is the same as width. I get roughly 3 dish clothes from one ball of Lily Sugar'n Cream. You may get more or less depending on the size of your dish cloths. I'm Going to Do It! !